Merlin, Stitched in Time: It's because of the 'Birds, I swear! At the heart of it, I blame the Angry Birds, after them comes Disney. And exactly for what praytell do I blame them? Why for the "Sew Star Wars" Bug, I've been obsesively playing the Angry Birds Star Wars game on my phone. It really is a fun one and the Leia Bird's power is awesome. Couple that with the news Disney plans three more Star Wars movies, has sent my sewing bug all a twitter. I love the costumes out of both trilogies. Personally I favor the original trilogy for story but the new for costume. I mean have you seen some of the costumes? 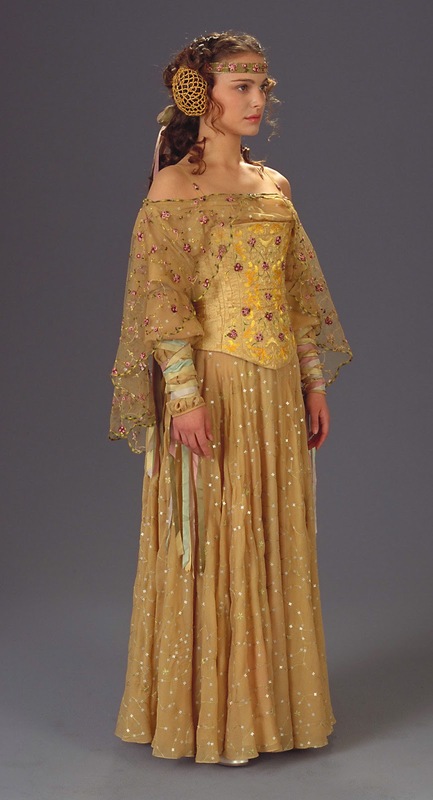 I'm particularly partial to Padme's costumes. Her Picnic Dress was one of the first I made. ﻿Alas this is not my version. Mine was made when I was 16 and of a pretty yellow quilter's cotton. I didn't have the shawl or the headpiece. But the piece de resistance in my opinion was my corset. My very first corset, which I painted the embroidered design on to. I will have pics as soon as I remember to take any. The blouse is currently in pieces, I wanted to redo it. And I do have new ribbons. However! This time it is not the picnic dress that is in my mind. Although if I finish the blouse redo, I may wear it to Faire. Ha! 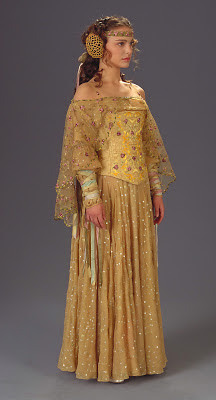 No this time it is Padme's battle dress from the end of Attack of the Clones. I have spent much time debating how to do the cloak, and spandex is cake for me to work with. (cough Catwoman cough). I also admit fascination for Princess Leia's white dress in Star Wars A New Hope and also for Arwen's Chase outfit in the Fellowship of the Ring but I fear that is to another post. All I have to say is any of us who sew Star Wars or at least based on many of the movies are truly in debt to Maggie (http://costumersguide.blogspot.com/). She is truly awesome to have compiled all the great pics from numerous movies. I do not know how she does it. So check out www.padawansguide.com for Star Wars costumes and www.costumersguide.com for many other movies. We will not discuss how many times I have been there to drool over costumes. PS: If you want, I can put the links in proper reference format, but it'll be MLA regardless of how pissy that makes my professor.